The nations are in crisis. The nations are gagged. Their spine is crushed. Deluded by the propaganda of their enemies, they are stripped of their aptitude to recognise themselves. Without orientation, the nations stumble through the shambolic global ether and lazily lounge in the hammock of ideology. The crisis is the crisis of nations in crisis! Answers are given without halt. By politics, journalicism and psychotherapy. Tin gods and false prophets play foul tricks on you – their answers corrupt your national communities of fate. Yet we have realised: Every nation has a core and inside of it a heart. But THEY drive a dagger into this heart, which bleeds out the soul of the nation. The nation is the answer to the crisis of the nation. The really true endeavor is to find the really true core of the nation and salvage it like a sunken treasure from the abyss of peoples. The German Apple Front has identified the apple as the innermost essence of the German, the Hungarian Garlic Front the bulb. One symbol, one destiny, one nation! Nations without a core are coreless nations! What does it take to implement the salvation of the nation? How can the movement prevail in political battle? The quarrel of the political class can only be ended if The Fronts protrude from the mishmash of euro-scepticism – thus even more sceptical. Thereunto wield words like a sword! Give easy answers. Slander. Populism. Smear campaigns. Distinction. Clarify that to the left and right of The Front there can only be The Front. 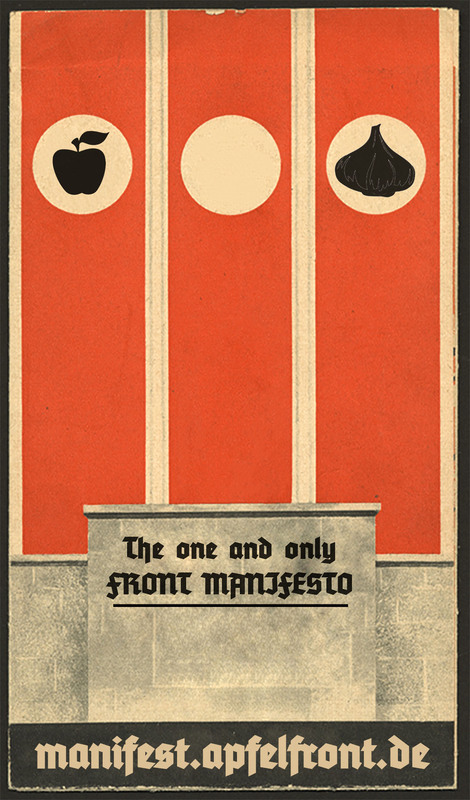 See no parties, see only The Front! How do The Fronts demonstrate their uniqueness? 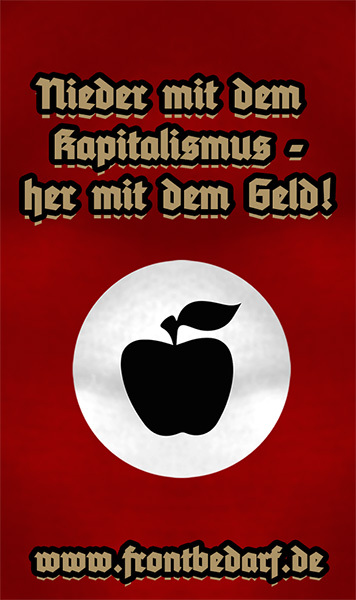 Like the German Apple Front seized the German apple as a symbol, all others must embrace their national core. An emblem of force and will for power is indispensable. United under this banner of a righteous national movement, flying colours and pressed brassards, the Weltenlauf marches into a future! On this stony path a Fuhrer-like personality leads to triumph! Until the final victory over evil and suffering – for a Europe how it always wanted to be: A bunch of insane nationalists! The Fronts are unique, like all fronts! Now out into the world to proclaim the tidings of joy, the convalescence of the peoples is imminent, everything complicated will be simple. Lies and problems – NEIN! NEIN! NEIN! Follow your destiny! German apples, Hungarian garlic, Italian tomatoes, Norwegian salmon, Greek olives and all the others – Fronts awaken!